As soon as Alexander Wang announced that he’d be giving up his position at Balenicaga, the next question on everyone's lips was about who was going to take his place. The head designer of Vetements was named the new Creative Director of Balenciaga, so now the conundrum is solved. Taking over for Wang is no small feat, but the more you learn about Demna Gvasalia and the Vetements brand, the more you’ll find that these two have some similarities — a major one being that celebs such as Kim K, Kanye, and Rihanna are all fans. I don’t know about you, but I can definitely get behind any brand these trendsetters are willing to support. Rihanna is arguably the biggest fan out of the three, having worn Vetements on multiple occasions. But that’s because this brand so perfect suits her DGAF vibe, while maintaining that chic element she likes so much. Slouchy, oversized hoodies and jackets are kind of Gvasalia's thing, and his designs are edgy, for sure, but then again, so was Wang. An avant garde way of thinking will do well at Balenciaga, and Gvasalia's predecessor was proof of that. I definitely think the Balenciaga brand is still in good hands because, at the very least, it still has a very fashionable support system of high-profile fans. 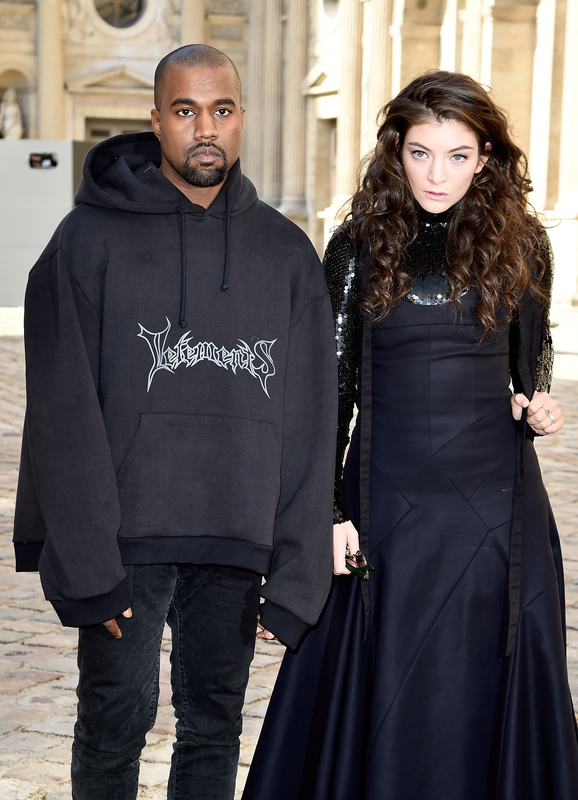 Here is the stylish trio repping Vetements. This is practically Rihanna's signature. Kanye styled the sweatshirt in his own way, of course. Even Kim K is feeling the whole oversized hoodie thing. This jacket was cool to begin with, but the fact that Rihanna wore it made it immensely cooler. Oh, there he goes again, sporting his hoodie. It's a little more dressed up with an overcoat this time. Remember that sheer turtleneck she wore at PFW? Yeah, that was Vetements, too. Of course Rihanna can rock a pair of sweatpants as daywear. The fact that all these style icons are already fans of the designer bodes well for his future at Balenciaga. Want more celeb style? Check out the video below, and be sure to subscribe to Bustle’s YouTube page for more hacks and tricks!